We moved our offices into a new building a couple towns away this week, and I ended up with a substantially larger office – “All the more to decorate” thought I, rubbing my hands. A gallery of my new digs is below. I haven’t decided yet how to fill out one wall, but the other walls are pretty much as I want them. I still see trees and greenery out my window (two windows, actually), thank goodness, and there are wild turkeys at the new place, too. 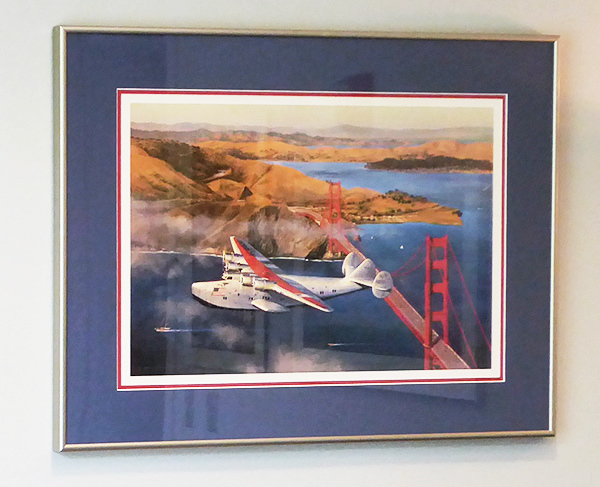 In the process, I finally got around to having my William Phillips “Clipper at the Gate” limited print framed at this little shop, and it came out pretty spiffy, with the frame and matting matched to the bluish silver of the aircraft, the deep blue of the water, and the red of the Golden Gate Bridge (actually called International orange) and the wing stripes. The aircraft is the Boeing B-314 flying boat, in this case the Pan American Airways California Clipper, NC-18602, which made regular runs between San Francisco and Hawaii – a nineteen-hour leg – before continuing to farther destinations. Only twelve B-314s were produced by Boeing, all for Pan Am, but it was – and still is – considered the acme of flying boat technology. The initial six had a range of 3,500 miles with fuel capacity of 4,200 gallons and the second group of six could travel 5,200 miles with 5,400 gallons, both variants far exceeding the range of other aircraft of the day. Travel on the clippers was strictly deluxe, with ticket prices comparable to Concorde’s and meals catered by top-notch hotels. One of the most iconic and desirable of all the early Pan Am flying boat posters, this image of the Boeing 314 Flying Clipper landing in a tropical lagoon captured, and continues to capture, the imagination of travelers. The location shown on the poster is an imaginary composite of several renowned bays throughout the South Pacific. It has been speculated that the view is Tahiti, Pago Pago and/or Diamond Head, however, the physical characteristics depicted do not coincide with the actual geography of any of these islands. Lawler most likely worked from photographs to derive a fantasy collage of a location infused with realistic details from various islands. It is rare to find this poster with text. We have found only two other examples at auction. The tail end of the gallery shows in detail some of the photos and items on display. I had 16×20 prints made of the three high resolution Apollo photographs – done beautifully by Shutterfly and Snapfish, I’ll add. Of the three drawings of mine on the wall, just one, the woman holding a newborn Bengal kitten, is my original pencil drawing – the other two are from high resolution scans I made before presenting the original drawings to their subjects. On the unfilled wall, I may put up 16×20 photos – approximately actual size – of two of the flight jackets I painted. This one is Rita Hayworth. And so, after all my labor and persuasion to get you to at last promise to take a week’s holiday and go off with me on a lark, this is what Providence has gone and done about it. It does seem to me the oddest thing – the way Providence manages. A mere simple request to you to stay at home would have been entirely sufficient; but no, that is not big enough, picturesque enough – a blizzard’s the idea; pour down all the snow in stock, turn loose all the winds, bring a whole continent to a stand-still: that is Providence’s idea of the correct way to trump a person’s trick. If I had known it was going to make all this trouble and cost all these millions, I never would have said anything about your going. Now in the light of this revelation of the methods of Providence, consider Noah’s flood – I wish I knew the real reason for playing that cataclysm on the public: likely enough, somebody who liked dry weather wanted to take a walk. 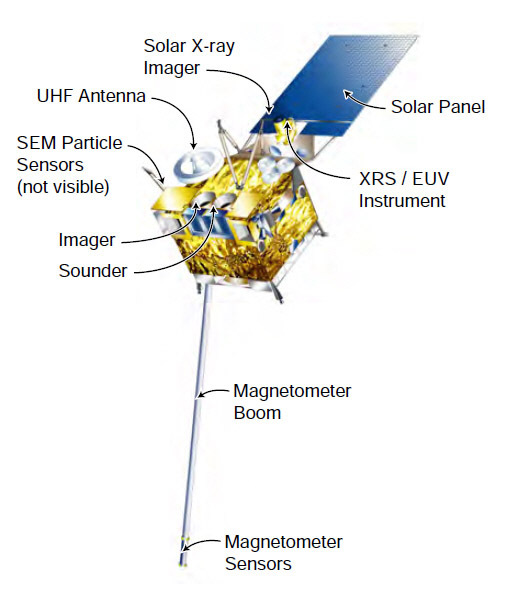 That is probably the whole thing – and nothing more to it. The blizzard he refers to was the Great Blizzard of 1888, which paralysed the Northeast US, sank or grounded 200 ships, blanketed the countryside with 20-60 inches of snow, and killed 400 people – 200 of them in New York City. The supremely annoying “Weather predictions must be perfect! You made me stay off the roads and I didn’t have to! What about my Taco Bell dinner! Call 9-1-1! Waaaa!” people in that area would be well-advised to stick that in their collective pipe and smoke it. Those ubiquitous “Me, me, me! Outrage, outrage, outrage!” chowderheads regretfully now fully enabled by antisocial media remind me of the Italian government trying to jail earthquake scientists a few years ago. I’m happy to report that their manslaughter convictions were finally overturned last November. And now for the other Twain bookend. I’ve read dozens of his speeches, but his talk on New England weather is my favourite. His part begins several paragraphs into this article, at the subhead SPEECH OF MR. SAMUEL L. CLEMENS. THE ANNUAL FESTIVAL OF THE NEW-ENGLAND SOCIETY – SPEECHES BY HON. GEORGE WILLIAM CURTIS, ‘MARK TWAIN,’ REV. EDWARD EVERETT HALE, REV. DR. JOHN COTTON SMITH, REV. DR. TAYLOR, AND OTHERS – INTERESTING LETTER FROM GEN. SHERMAN. The New England Society’s annual dinner at Delmonico’s last night was one of the most brilliant celebrations of the kind that has ever been held in this City. The preparations were made with great thoroughness, and the addresses by the respondents to the several toasts were full of earnestness, good feeling, good sense, and good wit. The dining-hall was filled with seven tables, the President’s table overlooking six others arranged opposite to it at right angles. Above the head of the President was suspended against the wall the banner of the New England Society, flanked by silken national ensigns, and on the opposite side of the hall, before the orchestra balcony, was a national shield also draped with United States flags. the tables were elegantly and tastefully decorated with baskets and set pieces of flowers. Before the President was a design, in flowers of delicate hues, representing Plymouth Rock, and there were many viands in the feast that recalled to genuine New Englanders the plain and beauty fare of the land of steady habits. The guests entered the dining room just before 7 o’clock, and at that hour Rev. Dr. John Cotton Smith, at the invitation of President Borden, said grace. Among those present were Rev. Edward Everett Hale, ex-Gov. Edwin D. Morgan, Hon. George William Curtis, Rev. John Cotton Smith, Rev. Richard S. Storrs, Samuel L. Clemens (Mark Twain,) Mayor Wickham, Joseph H. Choate, Rev. Dr. William M. Taylor, Hon. Elliot C. Cowdin, Hon. Salem H. Wales, Commodore J. W. A. Nicholson, G. B. Loring, Hon. Isaac H. Bailey, Dexter A. Hawkins, Prof. Bartholdt, (sculptor of the colossal Statue of Liberty), District Attorney Benjamin K. Phelps, Prof. F. B. Sanborn of Dartmouth College, representatives of St. George’s, St. Andrew’s and St. Patrick’s Societies, Assistant District Attorneys Bell, Russell and Rollins, Parke Godwin, Clark Bell, Police Commissioners, Wheeler and Erbardt, and Prof. W. E. Chandler, the whole company numbering more than two hundred. More than two hours were spent at dinner, when, at 9:30 o’clock, Rev. Mr. Courtenay gave thanks. President Borden then rose, and having called the company to order, he announced that Gen. William T. Sherman had written a letter of regret, saying that in the present condition of affairs at Washington he was unable to leave that city, and William M. Evarts was also detained in Washington and was unable to attend, and that letters of regret had been received from ex-Speaker James G. Blaine, Gov. Tilden, Gov. Chamberlain, of South Carolina, Robert C. Winthrop, and Gen. John C. Newton. Hon. George William Curtis was called upon to respond to the toast of “Forefathers’ Day.” He was received with prolonged applause, and by many of the company rising to their feet with waving handkerchiefs and loud cheers. His remarks were frequently interrupted by hearty expressions of approval, and his allusion to Abraham Lincoln as the development of the seed sown here two centuries ago by the coming of the Mayflower, was followed by vehement applause. His suggestions for the conduct of the Senate and the House of Representatives in the settlement of the political difficulties threatening the nation roused is hearers to the highest pitch of excitement, and evoked unanimous and prolonged applause. As Mr. Curtis sat down, he was greeted with the heartiest cheers, which subsided only to be renewed with greater vigor. Cheers followed the announcement of the sentiment, “The President of the United States.” In reply to the “City of New York,” Mayor Wickham humorously arraigned a large number of City officers for alleged shortcomings, charging them with being New Englanders, and succeeding in finding so many against whom the charges were applicable, and indicated them so plainly, as to cause unbounded merriment. Rev. Edward Everett Hale, in responding to the toast, “New England Culture,” made an address in which wit and wisdom were happily blended. Commodore Nicholson responded to the toast, “The Army and Navy.” Mark Twain provoked a storm of laughter by his rambling talk about “New England Weather.” Rev. John Cotton Smith commanded the fullest attention of the company by his response to the toast set down for him. Responses were made by Rev. Dr. William M. Taylor, Prof. Sanborn, and others. Gentlemen, will you give your reverent attention for a moment while I call upon Rev. Mr. Courtenay to return thanks? “Most merciful God, and Father, in whom we live and move and have our being; Thou who can satisfy the desire of every living thing, we render Thee our thanks for the satisfaction of our bodily appetites, and pray Thee that what we shall now hear may be for the satisfaction of the higher appetite of our intellects and our reason for the sake of Jesus Christ our Savior. Amen. SPEECH OF MR. SAMUEL L. CLEMENS. Who hath lost and doth forget it? Who hath it still and doth regret it? The other toasts of the evening were “The Clergy of New England,” responded to by Rev. John Cotton Smith; “Lafayette – who gave us himself and liberty; and Bartholdi – who gives us Liberty and Lafayette.” No. Response. “The Agricultural and Manufacturing Interests of New England,” Dr. George B. Loring, and “Our Sister Societies,” responded to by the Presidents of the Irish, Scotch, and English societies. 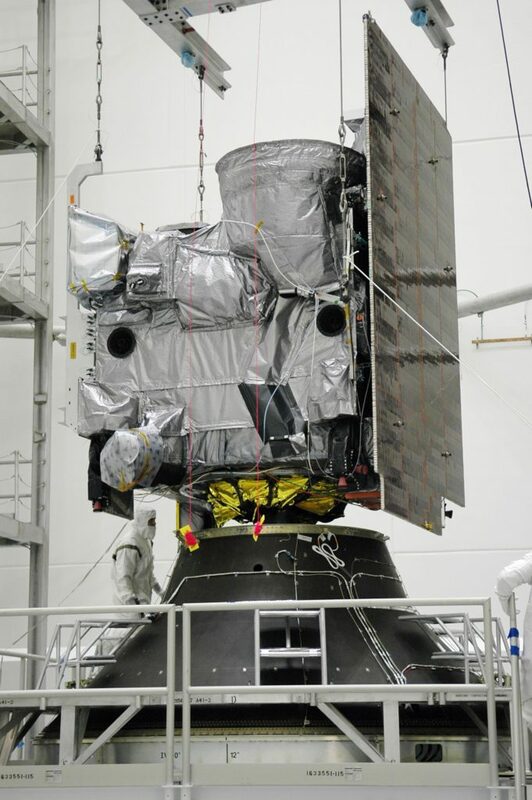 The proceedings terminated shortly after midnight. 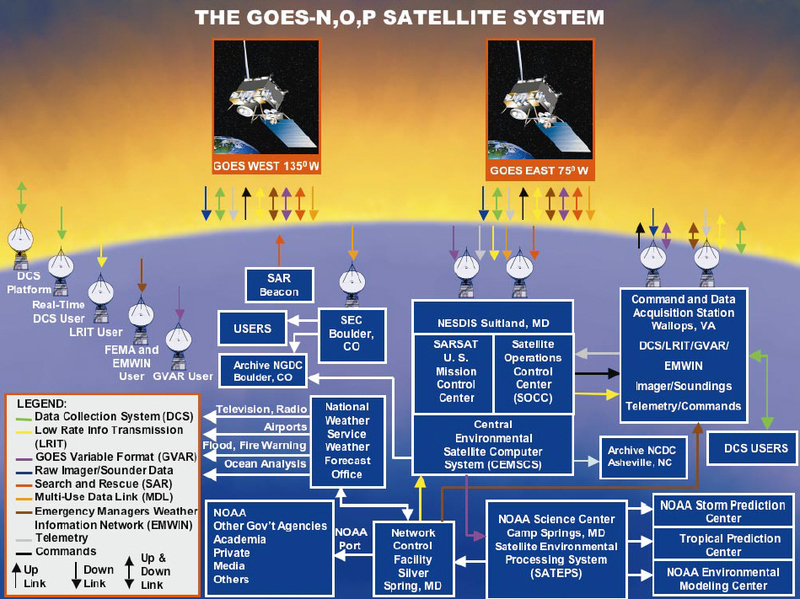 *At the time of Twain’s speech, Old Probabilities was the widely-used nickname of Cleveland Abbe, first scientist of the American Weather Bureau, predecessor to the National Weather Service. The latest addition to my office desktop Boeing gallery arrived in the mail today from Hong Kong. 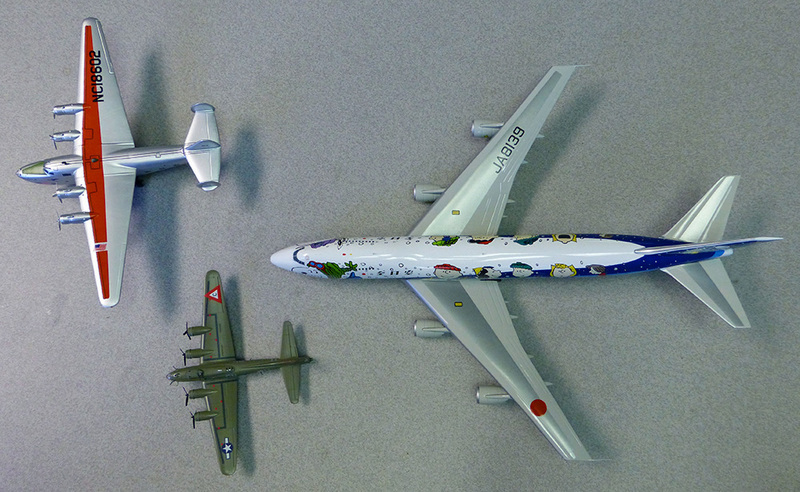 Now I have my three favourites, the B-17, B-747, and B-314, in the same 1:200 scale. You can click on any of these to see a larger size. 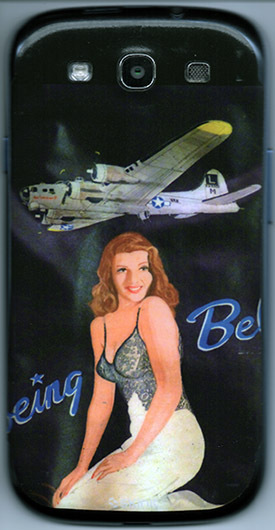 This Boeing Belle I painted years ago on one of my flight jackets – a little more eye-catching, I think, what with Rita Hayworth and all. 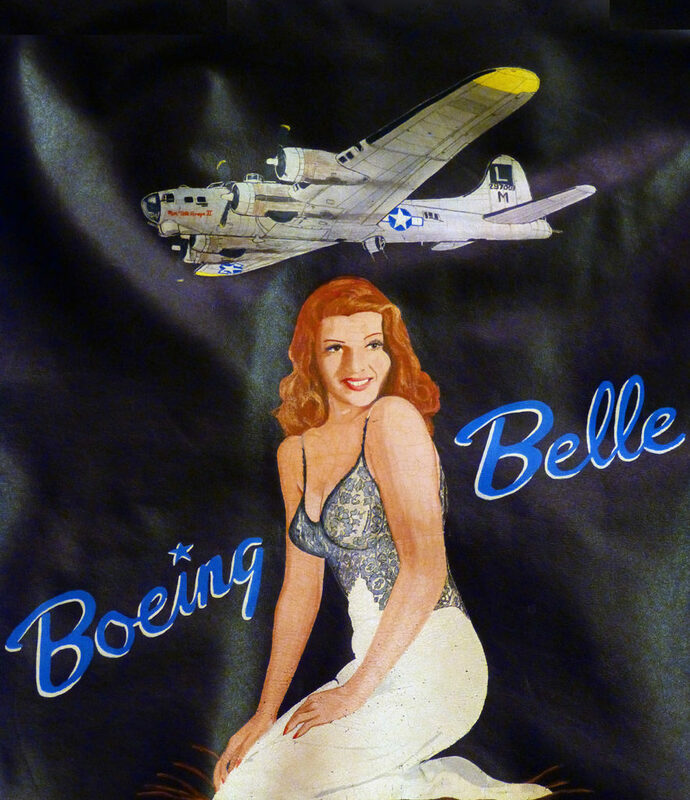 The painting is about 16″x16″ on the back of the jacket and the lettering is done in Boeing’s logo style of the 1940s. I took that photo of the painting in March so I could have Rita and the Mon Tête Rouge II on the back of my new phone, too, courtesy of Skinit. I lamented that the DVD I have, from the following year, is in that old “widescreen, but not – ha ha!” format, where there’s black stripes not only top and bottom but left and right, just as you see when you play the above, so the actual resolution of the video is horribly limited, to put it mildly – maybe one-quarter of full HD quality. It doesn’t look very good on my 42″ set, where it’s reminiscent of those first postage-stamp videos Windows 3.1 could play. But then I noticed in the YouTube recommended video list Memphis Belle – Take Off – Available May 6, and was pleasantly surprised to find out that the film was released on Blu-ray just a few months ago. This weekend, I’ll be able to watch it properly for the first time since I saw it in the cinema. 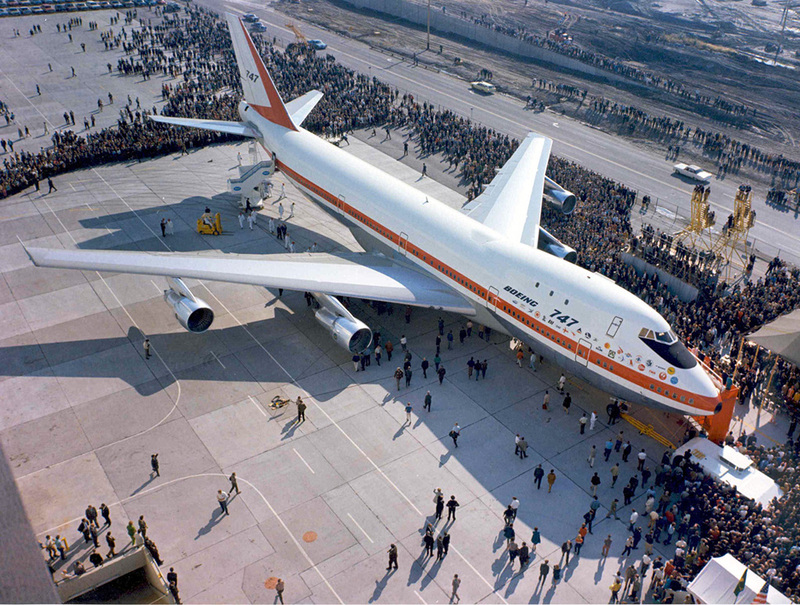 I was reading this article in the Seattle Post-Intelligencer on the long-overdue restoration of the prototype Boeing 747, shown above on its rollout day – rolling, yes, but without working engines yet – and got to wondering if the Museum of Flight still had “Bomber” Bob Richardson’s B-17F as well. I found that they do, which pleased me because I once flew in that B-17 in the days leading up to the 1988 Wings of Eagles Airshow at the National Warplane Museum in Geneseo, New York. I was a volunteer and arrived a couple days early, staying in the SUNY Geneseo campus dorms overlooking the NWM field. I got to talking with the museum president, Austin Wadsworth, a couple days before the airshow was to start, and he invited me to join the pre-airshow press flights the following morning. 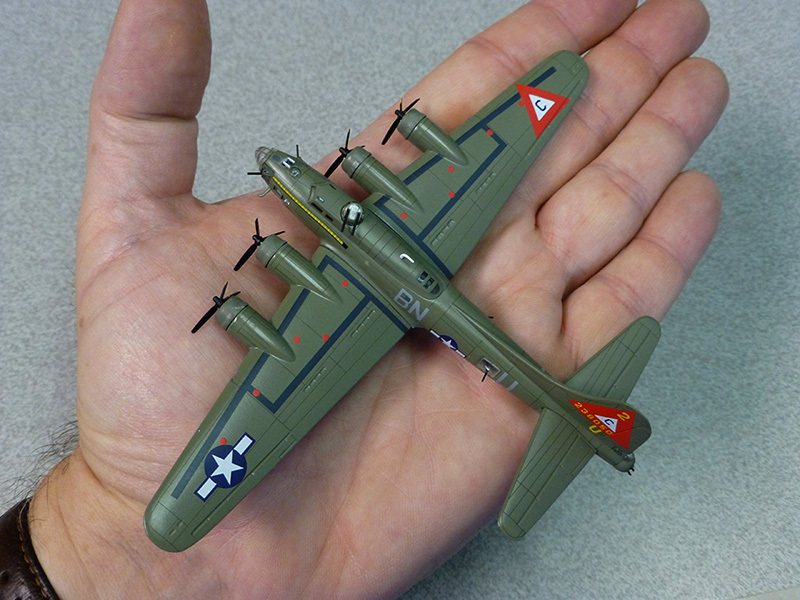 Those flights were to be in two B-17s. I remember my dropped-jaw excitement and exactly what he said as I left: “Get here early.” I needed no extra alarm. 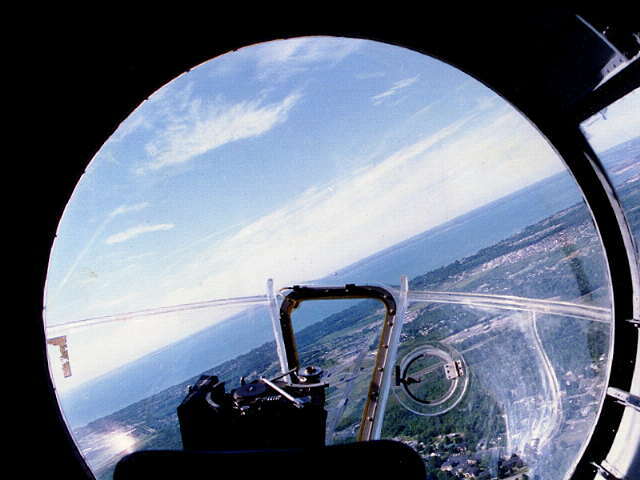 The next morning, I arrived at 6:30am and then proceeded to have the time of my life, flying off the grass airfield in the museum’s B-17G, Fuddy Duddy, up to Buffalo, then swapping between Fuddy Duddy and Bomber Bob’s Kathleen, at that time the only F-model B-17 still flying, as they took groups of reporters up for separate promo flights over Niagara Falls. By the time we returned to Geneseo six or so hours later, I had a grin on my face that lasted for weeks – one that returns as I type this. That’s an old scan of a physical photo – no digital cameras back then. I recently found and scanned at a much higher resolution another departure photo I took and it’s here. Richardson had stopped in Geneseo to be at the airshow with Kathleen on his way back to Seattle from the UK after participating in the shooting of David Puttnam’s “Memphis Belle” film (which was way, way over the top but still entertaining). I remember that he died the year after I flew on his aircraft. I didn’t know him well, but from all accounts he was quite a guy. I’m still grateful that he welcomed me on his aircraft that day with only an hour or so’s notice from Wadsworth. The airshow that followed was, in a word, spectacular, with a total of six B-17s present along with nearly a hundred other mostly WWII-era aircraft. I think it was the largest gathering of B-17s since the production of the “Twelve O’Clock High” film in 1949, and I don’t believe that number has been seen together since, either. 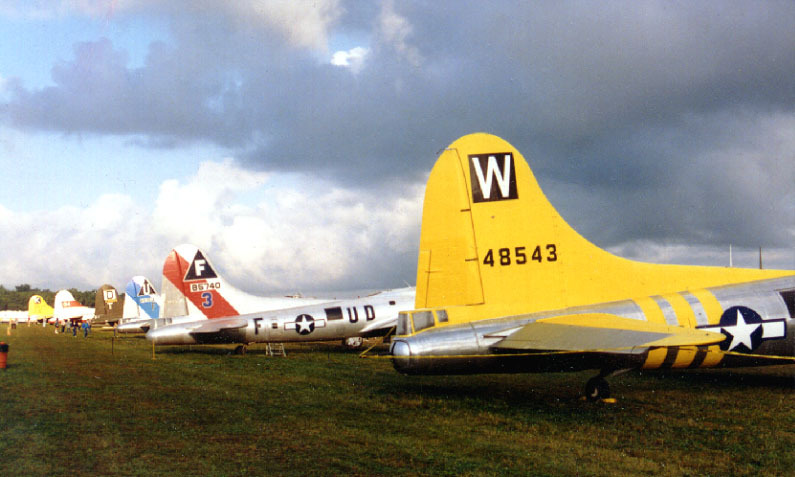 Just five B-17s participated in the “Memphis Belle” filming. The following year, I returned with an 8×10 of my six tails shot and presented it to Wadsworth along with my thanks for the once-in-a-lifetime opportunity. 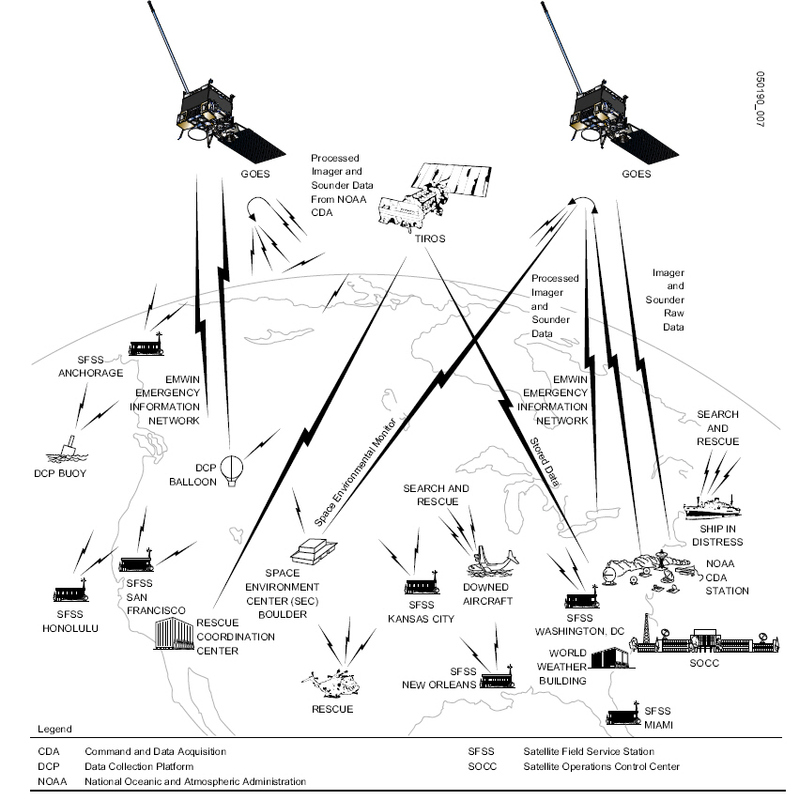 “Ah…proof it really happened,” he said with a smile. 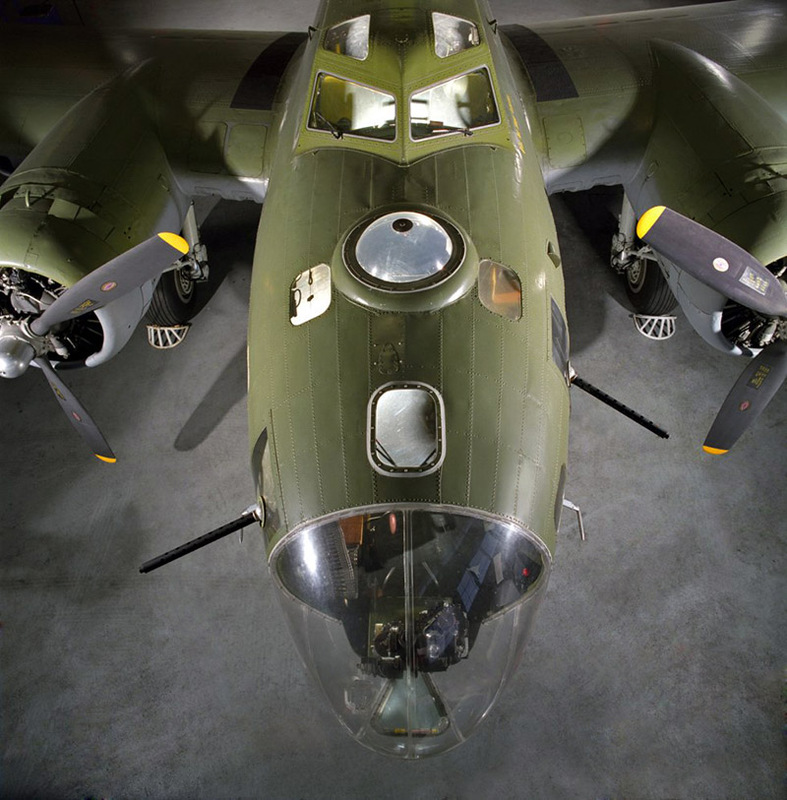 I read another pleasant bit of news just now when I searched to verify I was recalling his name correctly: The National Warplane Museum name has returned to Geneseo, with Austin Wadsworth still in the left seat. 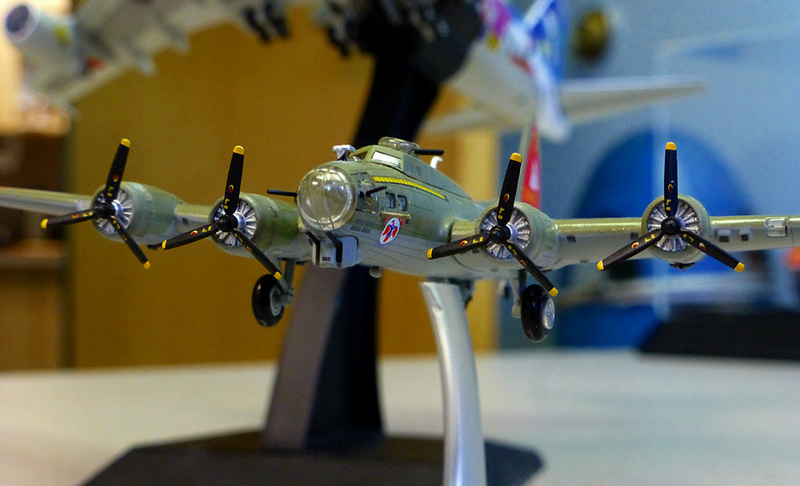 I figure if anyone could pull off another large flock of B-17s one day, that’s the man right there.